Looking for an alternative to high carb mashed potatoes; the same great taste without the high carbs? Look no further than this recipe! What looks like naughty mashed potatoes is really a cauliflower surprise! 1. Roast cauliflower until cooked at 200-210 C for about 10-15 minutes depending on your oven. You can also boil it, but the taste will not be as rich as roasting. I recommend roast! 3. Add in the cauliflower and smash it down with a fork. 6. Add other spices as desired. 8. Blend until desired consistency. Both creamy and chunky versions are both excellent. 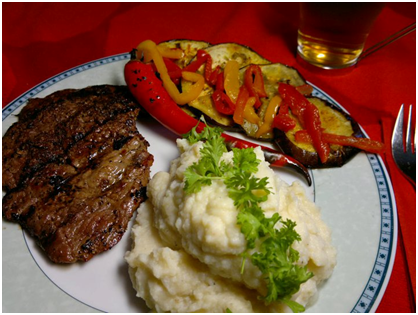 Served with a fiery grilled eggplant (eggplant, olive oil, habañero tabasco, and indian chili with sea salt) covered with sliced paprika and rosepepper steak (Lehtipihvi) in photo. Want a spicier version? Add 8 – 12 jalapeños. Serve with iced Peppermint Tea to cut the heat. Take control of your happiness…you deserve it. Our Ideal Protein experts can guide you on your journey to losing weight safely and effectively. Simply call 841-0150 to make an appointment. Refer a friend to join the IP program and you receive a $50 IP Product credit. For more information about Ideal Protein, contact us today!